Well, after all the recent boozing, I had to start the New Year with getting hydrated, in a healthy way. 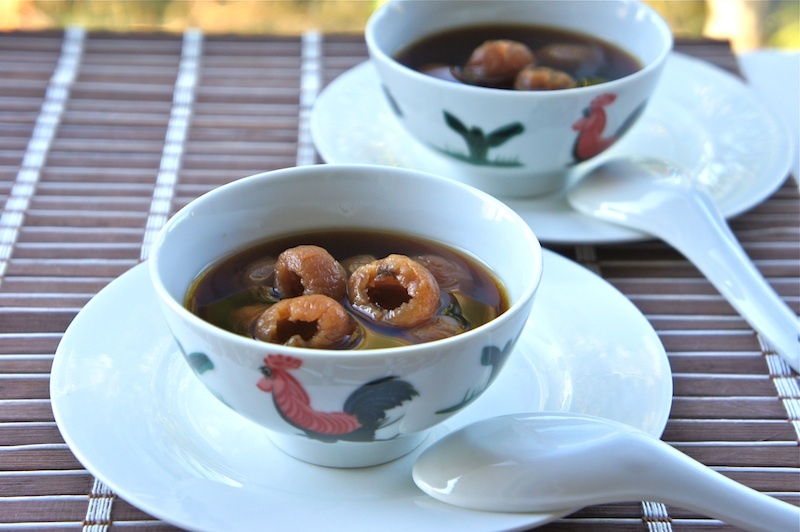 So, I decided to boil a pot of Loh Han Guo or Siraitia Grosvenorri With Dried Longan Drink yesterday. I can hear you saying now, “what???”. :-) Well, Siraitia Grosvenorri is grown primarily in the Southwestern Chinese province of Guangxi and in Thailand. The plant’s prized sweet fruits are used mainly for medicinal purposes and as a sweetener. It’s generally sold in dried form and used in herbal health teas or soups, which are widely enjoyed in South East Asia. Some of it’s medicinal benefits include alleviating respiratory problems, sore throats, and reputedly, it’s claimed by some to aid longevity too. Not sure about the last claim though. 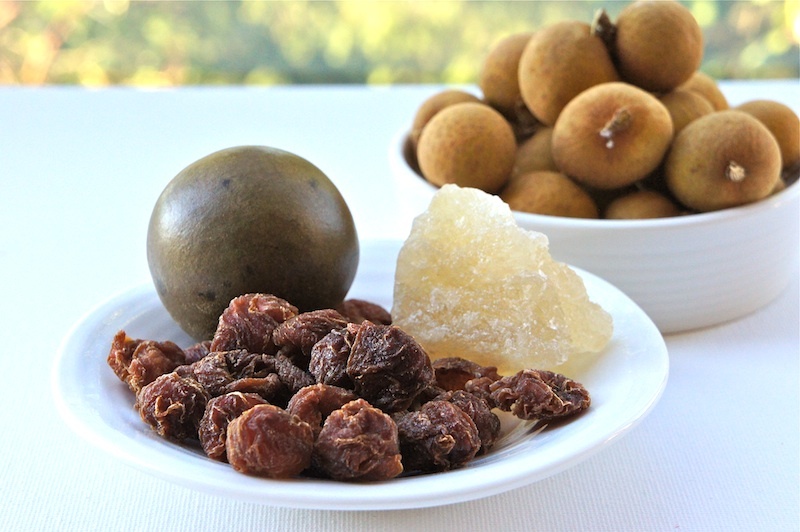 :-) Anyway, when boiled together with dried longan and rock or palm sugar, you have a really healthy and delicious dried longan drink. 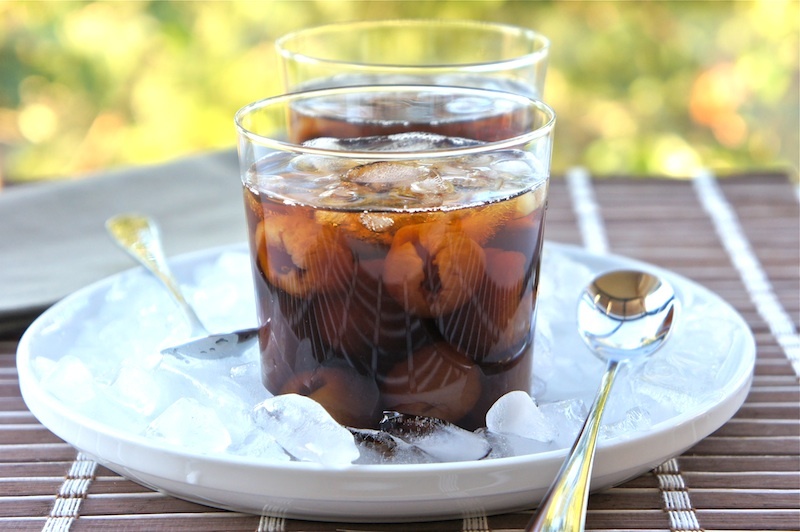 Here is a picture of the dried fruit and drink, which can be served cold or warm. Available at any Chinese medicinal shops in your area or if you’re around the North Shore area, get it at the Osaka/T&T supermarket. Bring the water to a boil with Pandanus leaves (if using), for about 5 minutes. Add Loh Han Guo and dried longan. Bring it to a boil and let simmer for about 20 minutes. Season with sugar and discard the Pandanus leaves and Loh Han Guo. Serve the sweet drink cold or warm. Angie, my mum used to make this type of drink at home. Good memories. Angie this drink looks refreshingly good! With all the rich and sinful food we do need this drink to clear up our system ha ha..I like this drink too. Sometime I like to add some grated fresh winter melon to it. Try it out as they are really good. Angie...this is good after all those rich food we had consumed the last few days and I agree with Gertrude, add in some wintermelon to it..it taste better :) Happy 2011!